Got my vintage Manon/Mayflower out tonight at a local astonomical society event. I tried the Vixen visual back adapter I picked up and had some problems. Using the Vixen 36.4mm to 1.25" adapter, a 1.25" enhanced diagonal, and a 25 mm EP I was unable to come to focus. If I racked it all the way in it was almost coming to focus. If I removed the diagonal and just used the EP in the visual back it was the opposite. I had it racked all the way out and it almost came to focus. Any thoughts here? Jim(fxxm747) how did you do it? I wound up using the original .965" visual back, diagonal and a 25 Kellner and got a fairly decent view despite the fact that the diagonal isn't the greatest. The objective does appear to be very good. No color on the moon. I was also able to see Saturn and Jupiter with it's 4 moons tonight. All in all, looks to be a great gift. All I need is to get the EP situation taken care of. Also, one other thing I ran into was that when I tried to barlow the .965 25mm I couldn't acheive focus either. This was using the original barlow. I suppose it could be trash. I have a vintage unused one with my Cirle T Sears that I can try. Hmmm. It could be the 1.25" 25mm EP itself. What did you use? I have a scope that only works with the eyepiece it was built for. (It is a surplus military Erfle, not standard commercial fare.) Any other eyepiece, and I can't focus in enough. Did you try any other EPs? Had the same problem with my mayflower used a .96 25mm kellner celestron. But I did get it to focus on the one end barely. Seems on the front end you ran out of focuser travel. Try a 18mm or maybe an extender. But I am new to this and dont wanna give bad advice. I did try other 1.25" EP's and none of them would come to focus. I don't understand why the original H20mm and original barlow wouldn't work though. I bought a .0965 to 1.25 diagonal for mine. Used the extension with a newer eyepiece and it wouldn't focus. Took out the extension tube and screwed the endpiece in, and it focussed very nicely with a Vixen 8-24 zoom. Good look at the moon and Saturn, but that EQ1 mount is something else! Still no color, either! Sirius was doing it's technicolor thing, but no purple fringe. Not sure I understand here. Is the crown element in the objective? How would this have happened? I did get focus with just the Huygens 20mm, but not with the barlow. 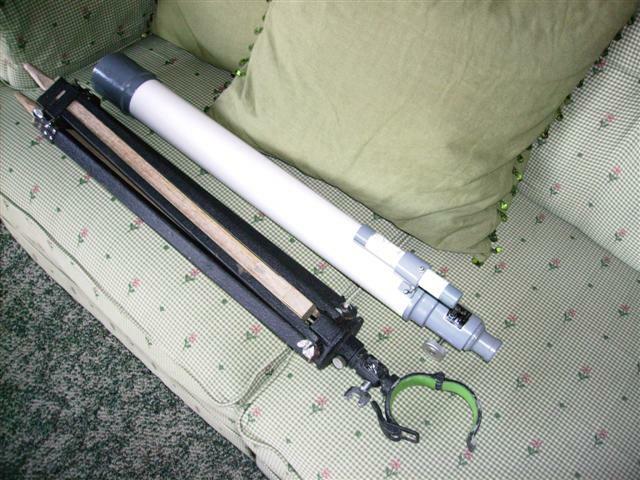 My Mayflower doesn't have a pull out extension tube like my old Circle T Sears, just the focuser draw tube. Is that what you mean? No, it unscrews. You can unscrew the part near the bottom that holds the diagonal. Then screw that smaller part into the tube. That got the Vixen to focus. Is that called a draw tube? I said extension because I needed one to get a camera to focus. Our scopes must be made different. The small part you are referring that the diagonal goes into is what people are calling visual back I believe. This is the part I replaced with the Vixen 1.25" adapter. It screws into my drawtube. Can't remove the draw tube as there would be no means to focus and there wouldn't be a place to screw the visual back into. My scope only has the draw tube, no rough focus pull out tube. Yes the 700mm only has the R&P focus tube. The draw tubes come on the f15 and slower scopes because of the long focal length. I really think the objectives MUST be miss-orientated. If you look at the picture that BHunt posted, that is the way mine is set up. Mine also has about a 2 1/2 inch tube that screws on also. Using that extra tube worked with the 0965 EPs and supplied diagonal, but I had to take the extra tube off for the hybrid diagonal and the Vixen.